To Cite: Ameri E, Ghandhari H, Nabizadeh N, Hesarikia H. Natural history of Coronal Balance After Spinal Fusion in Adolescent Idiopathic Scoliosis, Shafa Ortho J. 2014 ; 1(2):e35. Background: Following fusion surgery in patients with adolescent idiopathic scoliosis (AIS), the coronal balance undergoes some degrees of fluctuation. The frequent causes of these changes are stress relaxation of the spine and the gradual maturation of fusion mass. Health related quality of life is dependent on the final balance. Methods: Eighty five patients with AIS who underwent posterior spinal fusion surgery with different methods and in variable levels, were studied on time scales preoperatively, immediately postoperatively, 6 weeks, 3, 6, 12, 18 and 24 months after surgery. In every visit, the standing posteroanterior and lateral views were obtained. Coronal imbalance was proposed as the differences of C7 middle axis and S1 endplate middle axis. The imbalance less than 2cm was assumed as normal. Furthermore, postoperative trunk shift and lower instrumented vertebra (LIV) shift were measured as the other balance evaluation methods. Results: Eighty five AIS patients were included, 17patients (20 %) were male and 68 (80%) female. The mean age of patients was 16.03±4.3 years (range 9-37 years).The mean follow up period was 38 months (24-60 months). Left side coronal deviation was assigned negatively and right shift of balance was assigned with positive amounts. The clinical measurements of coronal imbalance based on plumb-line were investigated in the medical records. The range of pre and post-operative imbalance varied between -40mm and +35mm. The correlation between clinical balance with radiographic trunk shift, C7 plumb-line and LIV were -0.185 (p = 0.04), 0.22 (p = 0.05) and 0.0341(p = 0.38), respectively. The significant improvement of coronal balance was on the 12th months of follow up (p = 0.02). Conclusions: Based on our study, in AIS patients undergoing spinal fusion, the coronal balance is reached gradually to a steady state in an average of 12 months. Because of this spontaneous improvement in coronal balance over 12 months from a posterior spinal fusion surgery in AIS patients, surgical intervention is not recommended. Beyond 12 months, revision of symptomatic imbalance is justified before further consolidation of fusion mass. Measurements of spinal balance in adolescent idiopathic scoliosis (AIS) patients are mandatory to assess the amount of preoperative or postoperative decompensation (1). The initial postoperative coronal imbalance will improve overtime essentially as a result of flexibility in non-instrumented segments (2). Following to surgical correction of deformity, sometimes a few amounts of coronal imbalance may occur on initial standing postoperative radiographies (2). These remained or newly presented coronal deformity during the first 6 to 12 months after surgery should be differentiated from crankshaft phenomenon and other causes of trunk decompensation. These radiographic changes are often due to stress relaxation of the spine, gradual maturation of the fusion mass, and realignment of the curve (3). The purpose of this study was to assess the natural history of coronal imbalance and to identify the time of final realignment and remodeling of imbalance. This is a retrospective study on 85 AIS patients who were treated in one center and by different surgeons since 2004 to 2009. The inclusion criterion was all patients undergoing posterior spinal fusion regardless of instrumentation techniques or undergoing anterior release and fusion. Minimal follow up period was 24 months. The criteria of exclusion in sampling were follow up radiographs less than 2 years, lack of regular follow up presentation and radiographs, non-idiopathic scoliosis, and only anterior instrumentation of spine. Standard 36-inch posteroanterior (PA) views were obtained with patients in the standing position and bare foot. The patient should stand as erect as possible with the knees straight and the feet together. In patients with lower limb discrepancy, the pelvis was balanced with standing blocks. Usually 3 parameters are evaluated for measuring coronal balance: C7 plumb-line, lateral trunk shift, and shift of stable vertebra (4). 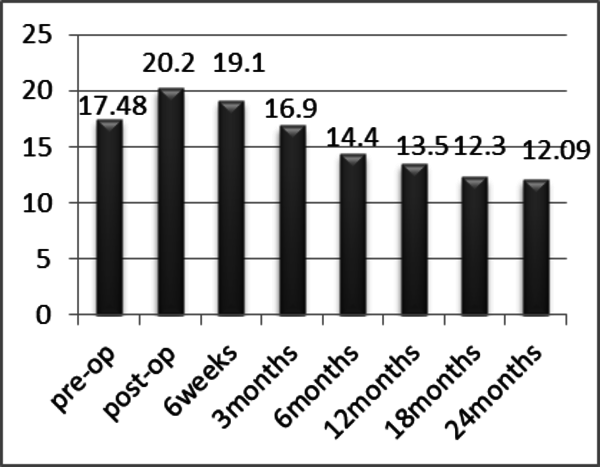 Standing PA views were evaluated in different intervals including preoperative, immediate postoperative, 6 weeks and then 3, 6, 12, 18, 24 months postoperatively. The collected parameters included Lenke and King curve type, trunk imbalance (lateral trunk shift), main curve magnitude, LIV shift. Clinically the position of the head over the pelvis is reflected by the alignment of C7 over the sacrum (plumb line) (4). Coronal balance was measured as the horizontal distance between the midpoint of C7 and the center of the S1.Coronal imbalance is defined while this distance exceeds 2cm (5, 6). The second method of coronal imbalance evaluation was trunk balance, which assess the position of the trunk over the pelvis (1). Trunk balance was evaluated by using lateral trunk shift. Lateral trunk shift was measured by drawing a horizontal line to the edges of the ribs of the apex vertebra and a perpendicular line that bisects this horizontal line; the distance between this perpendicular line and the central sacral line represents lateral trunk shift (3, 4). The third method for detection of coronal imbalance is the amount of displacement in stable vertebra in proportion to central sacral line (4). The analysis of data was performed by SPSS 19. Statistical analysis was based on regression analysis and paired student t-test and correlation. The results were significant if p < 0.05. Eighty five AIS patients were included, 17 patients (20 %) were male and remaining 68 (80%) female. The mean age of males and females at the time of surgery was 21 and 17 years, respectively (mean16.03±4.3). The mean duration of follow up was 38 (24-60) months. The Lenke type classification of the patients is summarized in Table 1. The mean of preoperative and postoperative imbalance was 20mm and 12mm respectively. Of 85 patients investigated for this retrospective study, 33.3% exhibited preoperative imbalance (more than 2cm). By initial standing postoperative radiography, 35.7% presented coronal imbalance, while over 24 months after fusion, only 15.5% remained imbalance coronally. In fact failure of surgery in correction of final coronal imbalance occurred in 15.5% of patients (Table 2). The significant improvement of coronal balance was over first twelve months of follow up (p= 0.02). Based on our statistical measurements, the coronal imbalance trend to undergo minimal increase during first 6 weeks postoperative from 17.48 mm to 19.1 mm. Then gradual realignment of spine initiates by diminishing the coronal imbalance from 19.1mm to 13.5mm at the end of first year postoperatively. There was no significant improvement of imbalance between 12 to 24 months after surgery (from 13.5 to 12.9 mm) (p=0.009) (Figure 1). The coronal imbalance shows immediate rise postoperatively and gradual decrease to lower than preoperative level over three months and more descent during first 24 months postoperative (vertical line represent coronal imbalance in mm). Age was the only significant variable on the logistic regression which could predict final coronal balance (odd’s ratio= 1.397, p= 0.04). In other words, as long as the patients grow up, the response of coronal balance to surgical intervention decreases. The correlation between clinical coronal balance and radiographic landmarks of balance is helpful to identify the most determinant indicators of coronal balance (Table 3). A considerable number of patients with AIS who undergo spinal fusion procedures reveal coronal imbalance (>2cm) on initial postoperative standing radiographs. Because of the flexibility of non-instrumented segments in these patients, the initial coronal imbalance will improve over a period of time (2). Based on Glassman study, sagittal deformity has the largest impact on the health related quality of life (HRQOL), followed by coronal imbalance including trunk shift and curve magnitude. Patients with large curves that are balanced had less functional impairment than those with a fixed trunk shift (7-9). In our study, comparison of three methods of coronal balance measurement revealed that the C7 plumb-line (head over pelvis) is more accurate and reliable indicator of coronal balance than other parameters. Radiographic C7 plumb-line exhibited the most correlation with clinical imbalance. The most frequent causes of coronal imbalance consequent to posterior spinal fusion procedures are crankshaft phenomenon, pseudoarthrosis and decompensation (adding-on) (3). The crankshaft phenomenon can best be appreciated by examining serial clinical photographs that demonstrate progressive changes in rib deformities, narrowing of the chest, and imbalance in the thoracic and lumbar spine. Radiographic changes greater than 10 degrees in curve size, apical vertebral rotation, and rib-vertebral angle difference possibly reflect the progression of the crankshaft phenomenon (10, 11). Decompensation is more likely due to ignoring the upper thoracic curve, no appreciation of dynamic bending views, selecting improper LIV, improper technique of instrumentation, lack of identification of structural curves (king 1C & 2), residual rotation of LIV and tilt of the lower disc, and overcorrection of main curve in selective fusion (12, 13). During the first 6 to 12 months after surgery, it is important not to assume that changes in radiographic measurements are always as a result of the crankshaft phenomenon or decompensation. In fact, these changes are often due to stress relaxation of the spine, gradual maturation of the fusion mass, and realignment of the curve (3). In AIS patients undergoing spinal fusion, the coronal imbalance (more than 2cm) improves gradually to a steady state (2). One important concern is to differentiate this postoperative natural resolving imbalance from crankshaft phenomenon and coronal decompensation. In terms of the natural history of postoperative coronal imbalance, Leroux et al. (14) in Canada and France believe that spontaneous improvement in coronal balance tends to stabilize 3 months after posterior spinal fusion using all pedicle screws constructs. They concluded that over 3 months after surgery, major coronal imbalance is not likely to be correct spontaneously. Thus revision surgery can be contemplated if inadequate coronal balance remains after 3 months (14). Based on Asgar et al. (2) study in Florida, initial postoperative coronal imbalance (>2cm) improves dramatically, but such improvement will reach to a plateau at 6 months, with 5% still persisting. Their conclusion demonstrates that the initial postoperative coronal imbalance can be expected to spontaneously obtain balance within 6 months. If patients are symptomatic from such imbalance, revision should be considered only after 6 months of observation (2). Our study results show that it takes approximately 12 months as an average time to reach final coronal balance. Dramatic improvement occurred over time as the uninstrumented lumbar curve adapted (13). We found early slight deterioration of coronal imbalance during initial six weeks postoperatively because of stress relaxation of spine and immature fusion mass. Then spinal alignment improves gradually regardless of construction type (screw, hook or hybrids). The final balance reaches to steady state in one year while any changes after 12 months is not significant or remarkable. The results of our study along with two other studies are summarized in Table 4. The limitations of this study were retrospective nature of study and the limited number of included patients. By expanding the data set, as well as regular clinical and radiographic measurements we will be able to distinguish the origin of postoperative imbalance deterioration more specifically and perform required surgical intervention in appropriate time. This study revealed that the spontaneous improvement in coronal balance occurs during 12 months from a posterior spinal fusion for AIS. Therefore, following first year of postoperative period, major coronal imbalance has less probability to correct spontaneously. In our opinion, any revision surgery of symptomatic imbalance might be considered beyond one year postoperatively, when spontaneous correction of imbalance is highly unlikely. 2. The majority of initial coronal imbalance following fusion surgery for AIS improves within Six months, oral presentation II. 43th annual meeting &amp; course of SRS.